First half ends 6-0, lacrosse game played at halftime, 2nd half: 4-0. Nine aside. 12/13/1890 Manhattan AC 16 - Princeton 5 16-0? 12/17/1892 Columbia College Freshmen 6 - CCNY 0 30 minute game 0-4? 12/2/1893 Volunteers FC of Harlem 12 - Varuna Boat Club 4 6,000 11/30? 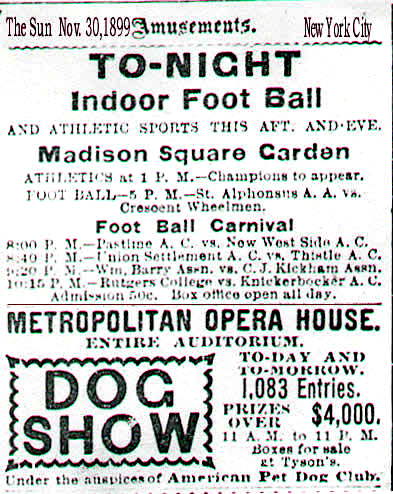 11/30/1899 Knickerbocker AC 11 - Rutgers 0 att: 3,500 16-0? •Some of the 1902-1903 games were part of the first Professional Football World Series, read about it here! See other early indoor football games.